Disaster In Japan: Monday's Developments : The Two-Way The latest news on the crisis in Japan. This woman was calling out the names of her family in the city of Soma in Miyagi prefecture earlier today (March 14, 2011). Update at 8:30 p.m. ET: We're pausing the live blog, now. But NPR's homepage will keep up with developments through the overnight. Update at 4 p.m. ET: On All Things Considered this evening, NPR's Jon Hamilton talks about the problems at a nuclear power plant in Fukushima. Its reactors shut down during the earthquake, but at three of them the cooling systems have failed. There have been two explosions so far that destroyed outer buildings. Authorities say the reactors' containment structures are intact. According to Jon, "the benchmarks for nuclear mishaps were set by incidents at Three Mile Island in Pennsylvania in 1979 and Chernobyl in the former Soviet Union in 1986. Most experts think what's happening in Fukushima will end up somewhere in between those two. The trouble is that leaves a lot of wiggle room." Click here to find a station that broadcasts or streams ATC. "U.K. energy consultant Prof Ian Fells tells the BBC that widespread power blackouts across Japan pose a bigger problem for the population than radioactive leaks from broken nuclear reactors." 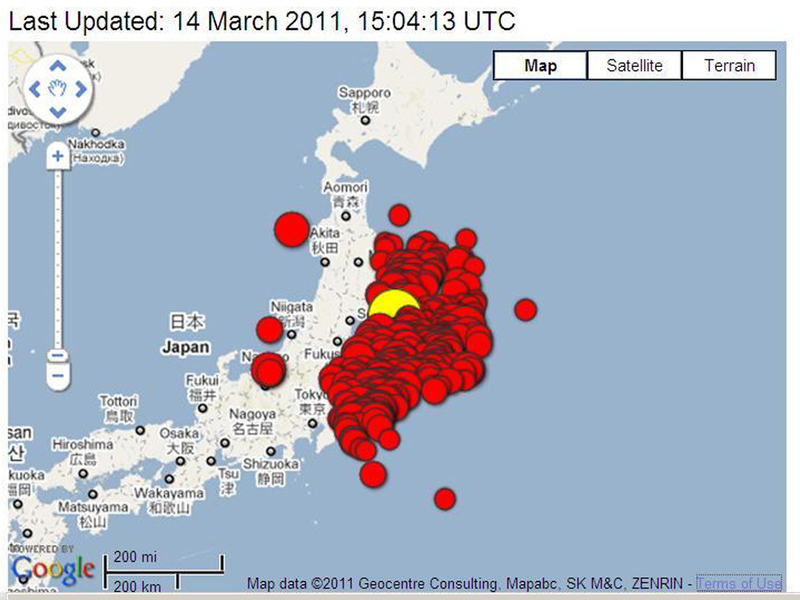 This map produced by the U.S. Geological Survey shows the location of the 8.9 magnitude earthquake that struck Japan Friday (marked by the yellow dot) and the 405 aftershocks since (as of 1:30 p.m. ET Monday, March 14). -- "The number of dead or people unaccounted for ... topped 5,000 after around 1,000 bodies were found Monday on several shores on the Oshika Peninsula in Miyagi Prefecture," Kyodo News reports. "The fate of several tens of thousands of people, including about 8,000 residents of the small coastal town of Otsuchi in Iwate Prefecture, remains unknown. According to a Kyodo News survey, local governments in the devastated areas are unable to contact up to 30,000 residents." -- There was a second hydrogen explosion at a nuclear power plant in Fukushima, where three reactors' cooling systems have failed. Officials say that so far the reactors' containment structures, which are designed to prevent radiation leaks, have held. They're rushing to try to cool the reactors. Update at 12:50 a.m. ET: Japan's NHK World TV is streaming its English-language coverage here. We reported earlier that some U.S. Navy ships moved away from the area near the crippled Fukushima nuclear power plant after radiation was detected on 17 helicopter crew personnel from the aircraft carrier USS Ronald Reagan. Those personnel had been helping in relief efforts. The ship's captain, Thom Burke, has posted a message on Facebook in which he says "the levels that were detected were very low levels. To put this into perspective, the maximum radiation dose received was equal to the amount of natural background radiation one would receive in one month from sources such as rocks, soil and the sun." It was washed off with soap and water, Burke adds. He tells "friends and family" of the ship that "I want to take this opportunity to personally assure you that first and foremost all personnel aboard the USS Ronald Reagan are safe and healthy." Update at 11:55 a.m. ET. On Tell Me More today, Wall Street Journal reporter Sudeep Reddy spoke with host Michel Martin about the economic effects of the disaster on Japan and the world economy. As he says, Japan's economy already had "a number of issues to sort through ... this is just adding to the problems." And shipments of Japanese goods to the U.S. — everything from cars to computers — will be disrupted. Update at 11:25 a.m. ET. Rods Melting At Three Reactors? "Japanese officials say the nuclear fuel rods appear to be melting inside all three of the most troubled nuclear reactors. Chief Cabinet Secretary Yukio Edano said Monday: 'Although we cannot directly check it, it's highly likely happening.' "
Reminder: The containment structures around the rods are supposed to prevent a leakage of radiation, even if there's a meltdown of some size. The U.S. Agency for International Development (USAID) is linking to InterAction.org's list of "appropriate disaster relief" organizations now working in Japan. There are 22 organization's on InterAction's list as of now and it has contact/donation information for each. Update at 10:35 a.m. ET. U.S. Moves Some Ships Away Because Of Radiation. "The Navy says it moved several U.S. ships away from a troubled Japanese nuclear plant after detecting low-level radiation on 17 helicopter crew members positioned there for relief efforts. Navy Cmdr. Jeff Davis, a spokesman for the U.S. 7th Fleet, said Monday that the Navy is committed to continuing the operation to help the Japanese after last week's earthquake and tsunami. But he says officials had to figure out how to continue safely after airborne radiation was detected Sunday by the carrier USS Ronald Reagan and on a helicopter crew returning to the ship from search and rescue operations." Update at 9:50 a.m. ET: Planned power outages have begun in areas near Tokyo, Kyodo News says, and it's estimated they will continue to be necessary through April as Tokyo Electric Power Co. copes with the aftereffects of the damage done to nuclear power plants by Friday's earthquake and the tsunamis that followed. Update 9:34 a.m. ET. Reporter Doualy Xaykaothao is in Koriyama, Japan, watching smoke billow from the damaged Fukushima nuclear power plants about 30 or 40 miles away. She tells NPR Newscasts that many people are trying and failing to get flights out of the region. They're afraid; seismologists believe Japan may be struck by another powerful earthquake in coming days. "TAKAJO, Japan — A tide of bodies washed up along Japan's coastline, crematoriums were overwhelmed and rescue workers ran out of body bags as the nation faced the grim reality of its mounting humanitarian, economic and nuclear crisis Monday after a calamitous tsunami." -- Update at 8:45 a.m. ET: The "worst-case scenario for Fukushima [nuclear] plant unlikely to be like Chernobyl," Kyodo News reports, citing Japanese government spokesman Yukio Edano. He's also said that three nuclear reactors at the plant "highly likely facing melting," Kyodo says (those are the news service's words, not a direct quote from Edano). -- Update at 8:20 a.m. ET: Japanese government spokesman Yukio Edano says fuel rods may have partially melted at reactor Unit 2 of the Fukushima Dai-ichi plant, Kyodo News reports. Reminder: The reactor is inside a containment structure designed to prevent any radiation leaks even in the event of any meltdown. -- Update at 7:55 a.m. ET: The Associated Press writes that "a Japanese utility says fuel rods at a troubled nuclear reactor have been fully exposed. The exposure happened at Unit 2 of the Fukushima Dai-ichi plant — the latest reactor to lose its ability to cool down. .. Tokyo Electric Power said Monday sea water is being channeled into Unit 2. It did not know if the rods were covered yet." As we reported earlier, Japan's NHK had reported that the reactor "lost all its cooling capability." There have already been hydrogen explosions at two of the facility's reactors. But authorities do not think the reactors' containment structures, which are designed to prevent radiation leaks, have been breached. -- Update at 7:28 a.m. ET: "The Nuclear and Industrial Safety Agency says [another] reactor at a power plant in quake-hit Fukushima Prefecture has lost all its cooling capability," Japan's NHK TV reports. And it adds that "fears of a hydrogen explosion at the vessel housing building are growing as the water level of the reactor is falling. A reaction with the steam and exposed fuel rods generates a large amount of hydrogen. Hydrogen blasts have occurred at two other reactors at the plant." The reactors are all within containment structures that are designed to prevent radiation leaks even in the event of a meltdown. Japan is coping with three major disasters: the record earthquake on Friday and scores of aftershocks; the subsequent tsunami; and damaged nuclear power plants. There's been a second explosion at the damaged Fukushima Daiichi nuclear plant. The blast occurred in the Number Three nuclear reactor. On Saturday, there was a similar blast at the Number One nuclear reactor. NPR's Joe Palca explains what's happening on Morning Edition, including brewing problems with a third nuclear reactor, and fears of more powerful aftershocks. 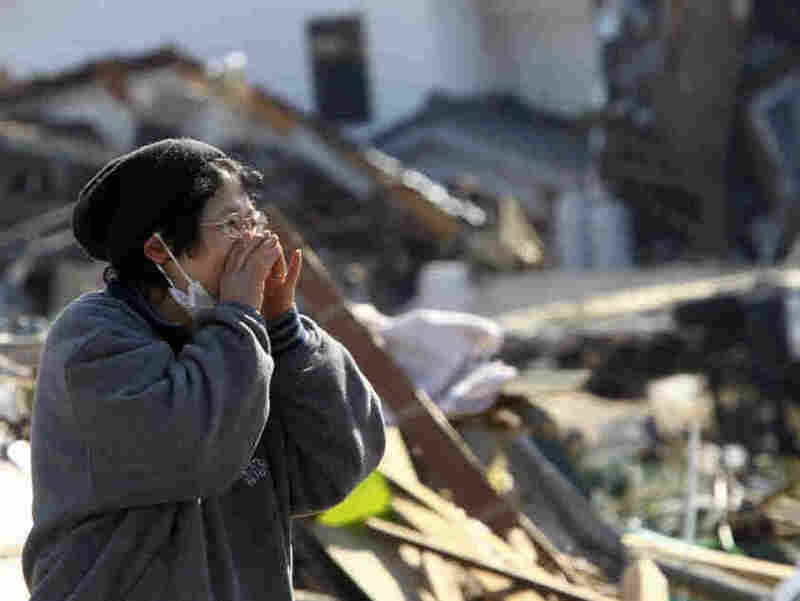 The death toll from all the disasters is unclear. Kyodo News of Japan says 5,000 people are dead or missing. Of that number, 2,000 are bodies discovered on two beaches in Miyagi Prefecture. The Japanese government is delivering relief aid to millions of people without homes, food or water. But roads are destroyed and Tokyo Electric is rationing power, cutting electricity to commuter trains and delaying commuters. That'll make it harder to get supplies to victims. NPR's Anthony Kuhn tells NPR Newscasts the Bank of Japan would provide private banks with cash to meet their needs in the worst disaster areas. Iniital estimates suggest damage will cost tens of billions of dollars. Sporting officials are postponing or canceling events. The AP reports the International Skating Union has called off the world figure skating championships set to open on Friday. Some baseball teams report their stadiums are damaged.